INSIDE: Naming feelings is an important part of a child’s social and emotional learning. Get the inside scoop from me with exclusive content from Education.com! We have been naming feelings all week… anxious, excited, nervous, stressed, sad, happy… the list goes on and on because school started today. After a long last week of summer, my kids all strutted happily into school. All of them are there for the full day, for the first time ever. I can’t even believe it! Just last week I was wishing they were in school and today I am a blubbering mess wishing they were fighting and complaining that I made them clean up their dirty socks! I am feeling sad. Really sad. It’s a big change for me and I don’t quite know how to deal with it. I think time will help. See what I did up there? I named my feelings. Adults can do it (with practice), and kids should, too. And they should learn how to do it as soon as possible. I promise you that teachers work on this in the classroom, but it’s something that we can do at home as parents. There is so much that our teachers are expected to cover in a day. I feel the need to support them by giving our kids enough words to describe how they feel when they are away from us. You and I know when our kids are feeling sad or jovial by just looking at them. The other adults and children that interact with them, however, do not know. So, it’s important to teach them the power in communicating their feelings. The next step is teaching them how to be able to identify possible triggers for their feelings once they become experienced with labeling them. I encourage you to read on to learn more. 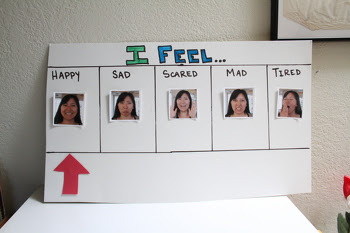 I was first introduced to the concept of an “I Feel” poster when I taught elementary school in 2003. I had a large poster hanging on the wall that had lots of faces on it. The kids could go up to it and find very specific faces to describe their feelings, there were almost too many choices. Once I started teaching preschool, I knew I needed something similar for my students. Preschool is a big change. It’s the first time many students are away from their parents and there is a lot of stress for both parents and their children. However, I knew that my big poster of faces wasn’t appropriate for this age. As an early childhood educator, I have found that young students need fewer options in order to be successful with this task. I used a smaller poster that focused on the basic emotions when naming feelings. Using pictures as cues to emotions helps our youngest learners begin to identify how they are feeling. The pictures are helpful for all types of students, including our ELL and special education students. I was able to successfully use my poster in a classroom with six different languages spoken and with a non-verbal child. The power of pictures and teaching the children how to identify their feelings is helpful across many settings, ages, and diverse learning needs. Naming feelings is a really important part of their development, no matter the communication level of the child. I promise you that your kiddo can benefit from this at home, too. Education.com contacted me and asked if I would share this with my readers. Since it is an activity I believe in and have experience with using successfully with students from 3-12 years old I wanted to share it with you. I think you’ll find it appropriate and a good place to start if you’ve never tried something like this in your home. In first grade, teachers expect kids to know their basic feelings, use their words, and also recognize feeling words on sight. It can take a lot of practice before your child can figure out if he’s scared, sad, tired, or angry. In this activity, you’ll work together to create a “feeling meter” to hang on the door so your child can identify what he’s feeling and give you a heads up! Take one piece of poster board and place it horizontally on the table. Use a ruler to mark one horizontal line 2″ from the top, and a second horizontal line 4″ from the bottom. There will be a 7″ space between the two lines. Use your ruler to mark four lines vertically from the 2″ line to the second horizontal line, spacing them pretty evenly apart. You should end up with five columns that measure about 4 1/2″ wide each. Help your child cut five 1 1/2″ strips from the “hook” (or rough) side of the sticky Velcro. Peel off the back and stick the adhesive at the bottom of each column, in the 4 1/2″ space. Using the felt, help your child cut out an arrow (triangular or house-shaped) that’s 2″ wide. Hand your child a marker to write a title, such as “I Feel…” above the 2″ line in clear block letters. Next, have him label each of the five columns: happy, sad, scared, mad, and tired. Print or develop the photos. Invite your child to paste the photos in the columns, underneath the appropriate title of emotion. Finally, secure the poster onto his bedroom door. Invite your child to stick the felt arrow onto the Velcro underneath the emotion he’s feeling. Next time he’s ready to slam his door, invite him to identify what he’s feeling on the poster. It opens up the opportunity to talk about his feelings in a safe and supportive atmosphere, and helps his reading and writing skills to boot! Thank you to my partner at education.com for this exclusive naming feelings activity for our kiddos. I know that I need to practice using it and my kids, do too. We all have had an anxious last few days, mostly because we tried to fit in all our “last” bits of summer before another year blasts off at the speed of light! There have been tears and jumps of joy, so this is going to come in handy tonight! Here’s to hoping your littles are off to a good start in both their academic & social and emotional learning. Before you go- head on over to this post “‘Twas the Night Before School Started“. It sums up my feelings last night! More about Education.com: Education.com aims to empower parents, teachers, and homeschoolers to help their children build essential skills and excel. With over 12 million members, Education.com provides educators of all kinds with high-quality learning resources, including worksheets, lesson plans, digital games, an online guided learning platform, and more. Great advice–as an adult, I’ve learned that too often when feelings are her (isolated, hurt, left out), I go straight to mad. Working on that.